The Mandala Project provides a creative visual and experiential demonstration of unity with diversity. Through art, the project brings people together to create something larger than themselves while honoring the uniqueness of the individual and celebrating the benefits and gifts of a collective experience. Recognizing what we have in common, while respecting our differences, increases our capacity for creating peace. Truth, beauty, and goodness are values honored by all cultures: through the pursuit of knowledge we discover truth; in nature we see beauty; from acts of kindness we experience goodness. Combined with art, these values are the foundation on which we build connections that cultivate peace. The project hosts an on-line gallery to which everyone, regardless of race, gender, location, or beliefs, is invited to submit a personal mandala. The submissions become part of a collective art piece, reflecting the diversity of the human race within a unified structure. 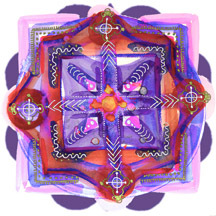 Each mandala can include a message from the artist as well as email address to enable viewers to make contact. Educational programs based on the message of unity, as expressed through the mandala, are used in national and international programs to share and exchange lessons creatively. Elementary classes are linked with one another to co-create mandala artworks utilizing an art-based curriculum that promotes unity and tolerance while enhancing core learning content. The Peace Mandala Labyrinth Project will be an educational program and a collective art piece displaying the unifying message of the mandala. Individual mandalas created by participants will be connected with one another to create a walking labyrinth – a collaborative art piece that will be a personal and shared experience.